Steve Garfield wrote a short post today about The Future of Video. One of the products he linked to is a wearable camcorder from Looxcie. You can check out some early reviews on Amazon.com (aff). Think Jawbone, but with a video camera attached, able to record up to five hours of video (according to the marketing copy). 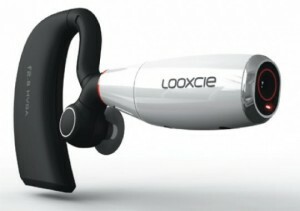 If the quality is as good as the examples on the Looxcie YouTube channel, this product will be awesome. I would have killed to have one of these when I was in Iraq. In fact, I tried buying a “spaghetti cam” – like the ones you see in movies – and a solid state hard drive for recording, but the vendor I used never sent the goods. I went on my last tour without my dream – a way to record, hands free. Where would I like to see Looxcie go from here? Increase the video quality. This is a must, and something I’m sure they’re working on. Add a transmitter so that I can send my video feed to a laptop, or even a thumbdrive-like accessory in my pocket, for recording. Add streaming, live to the ‘net. This would probably have to start with the secondary step of piping the stream through a laptop, but some day… Some day we’ll be able to stream live from an “ear cam” to uStream, or to a centralized production hub – Live. I’m excited about what Looxcie represents. I can’t wait to see where this product category goes. And I’m going to be watching Steve’s blog and Twitter stream more closely, now that I know he’s interested, too. Thanks for the heads up Mr. Garfield. This entry was posted on Sunday, September 26th, 2010 at 01:58 and is filed under Featured, social media. You can follow any responses to this entry through the RSS 2.0 feed. You can leave a response, or trackback from your own site.